An outstanding doctor who combines a strong education, vast experience, wisdom and a powerful intuition to diagnose a patient. From Dr Moussavi, to the staff, the office itself , everything is very professional. The concern & care genuine. Your healthand well-being is obviously their utmost concern. Very thankful & highly recommended. From Dr Moussavi, to the staff, the office itself , everything is very professional. The concern & care genuine. Your health and well-being is obviously their utmost concern. Verythankful & highly recommended. 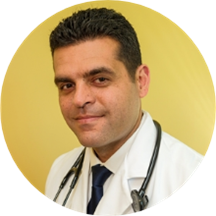 Dr. Moussavi graduated with honors from medical school at the University of Leiden, Holland in 1999 and completed his residency training in Internal Medicine at Albert Einstein Medical Center, Philadelphia, PA in 2003. Dr. Moussavi practices general internal medicine with an emphasis on preventive health care. Dr. Moussavi is a Diplomate of the American Board of Internal Medicine (ABIM). Dr. Moussavi has a special interest in preventive medicine such as hypertension, diabetes and other chronic health problems, in addition to cosmetic procedures such as botox, juvederm, kybella, tattoo removal and laser hair removal and is certified in Aesthetic Medicine. I was helped very well. Very professional and understanding doctor & staff. Make me feel at home. He is very nice and friendly. He takes care of the concern. Met with Robin Greb NP at Stafford location after mistakenly selecting the Woodbridge office for NY appointment. They were very accommodating with the change. Ms. Greb was very professional and helpful. Highly recommend this practice. Staff was accommodating and fit me into a tight schedule. I was running late and they were transparent about the wait time and courteous of others. Dr. Moussavi was polite and listened to my concerns. He allowed me to call myprevious doctor to make sure I had the right information. Dr. was prompt about giving me the right test orders and informative. Professional, very knowledgeable, and listened well to symptoms. He is an excellent doctor with good bedside manners who spends enough time with you to come to a final correct diagnosis and treatment plan. Great visit. Am happy with diagnoses. Excellent doctor! Been his patient now for 14 years. good bedside manner, very professional regarding unusual health topics to be discussed that most people are embarrassed to talk about. highly recommended! Dr. Moussavi has excellent bedside manner and really listens to concerns you may be having. Highly recommend. Been visiting Dr. Sohail Moussavi for over 12 years now. Great Doctor who has always pointed me in the right direction on Health concerns and general physical well being . For top notch Health care , look no further than this office . The Dr explained that he couldn't help me but gave me a referral. Very nice and helpful. Dr. Moussavi was wonderful, listened very carefully to me and provided a thoughtful response, diagnosis and treatment plan. Would highly recommend! All the staff were very nice and Dr. Moussavi answered all my questions. This was my first visit. I found Dr. Moussavi to be very professional, friendly & thorough. Very happy with his services so far. He was very pleasant and professional. He addressed all of my concerns and I felt comfortable around him. Dr. Moussavi is amazing. As someone who hates doctor trips, he listens, remembers, and cares. I can’t recommend him enough. Quick, very convenient. Dr. Moussavi was very pleasant and helpful and very professional. Dr. Moussavi is very detailed and easy to talk to. Highly recommend him. Very professional and concerned about my well being. I was called very promptly. Dr. Moussavi greeted me cordially and gave me a good examination. He also explained what I should do about lab work. The doctor was very helpful. Great bedside manner by Dr. Staff was pleasant and attentive. I really enjoyed my appointment with Dr Moussavi and appreciated the time he put into hearing my problems. Dr Moussavi took time to explain what routes we could take and I felt that he genuinely cared for the conditions I'm facing.Great Doctor, I look forward to havong him as our PCP! I was in for a physical....however it was a very short visit...i don't believe all the testing during a annual physical for a male. I ask the nurse whom came in after the Dr to give us referral etc... I voiced. Y concern of during a annual physical that ALL was not done....the nurse nonchalantly says ohhh I don't know what he does during a complete physical....Umm RED FLAG ...what do you mean. An annual exam should be standard and a guideline in what is done during an annual exam should be more in depth then a 5 min convo and a 2 minute exam then blood draw is NOT all that should be performed during an annual wellness exam.